Waterbury Clock Company, Waterbury, New York, Chicago. per the full label. "English Drop No. 3", C. 1892, according to the catalogs. Waterbury made 3 styles of the English Drop; this model has more inlaid veneer and is fancier than the other two. Walnut veneer case is 27.75" high, has carved side pieces and extensive inlay around the round bezel, door, and base. Good veneer all over, has a couple of small splits from dryness but not obtrusive. This is the calendar model, 8 day, strikes a coil gong on the half hours and hour. Large, complete, black label inside the case. Label on the back is interesting. They would adapt it for the different styles, No. 1, No. 2, No. 3; and calendar, or no calendar. In two places on the label they have the price at $8.00. 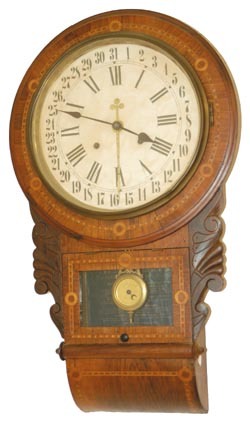 Now the negatives; original and correct brass pendulum but the slow-fast pointer is broken; the calendar hand is Ansonia, not Waterbury; it now has a new paper dial on the old pan. The good far outweigh the negatives on this clock. Ly-Waterbury #241.